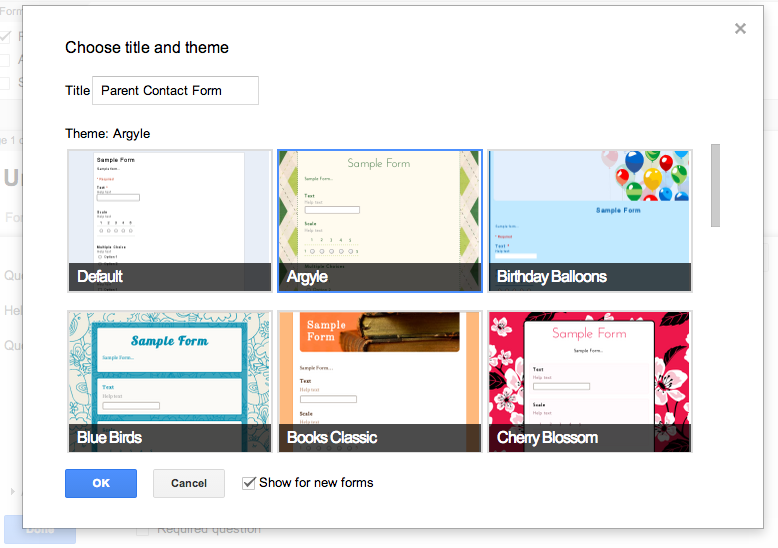 If you're already an experienced Google Drive user, then you probably already know all about using forms. If not, then this post is for you. These Google 101 posts are going to be for the very new user. 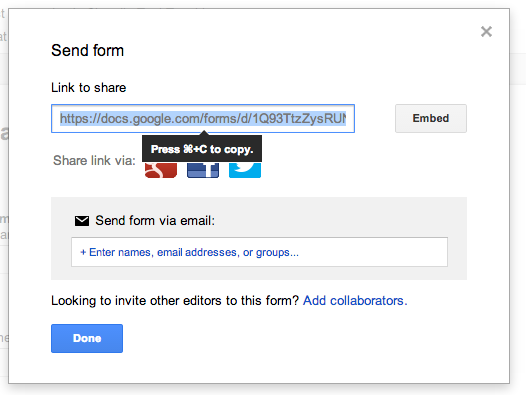 In today's edition, I'm going to walk you through - step-by-step - the process of making a parent contact form in Google Drive. If you are new to using Google Drive, check out this section of my Learning to Teach With Google site for an introduction to what Google Drive is and some examples of what you can do with it in the classroom. Once you've acquainted yourself with your Drive, you need to create a new form. You have a number of options for item types, ranging from short text answers to multiple choice or even videos. Start adding items, choosing the type from the list in the drop down (found by clicking the down arrow next to "add item"). Once you start creating an item for response, you have a number of options, such as making the question required (note that if a question is required, the parent won't be able to submit the form without answering it, so be sure it's one that they will definitely be able to answer). You can also duplicate the question (for instance if you want multiple phone numbers). When you've finished, click "Done." The confirmation page is the page that will show up after the respondent has finished and submitted the form. I suggest unchecking all but the last box, "Allow responders to edit responses after submitting." At the very top of the form, there is a box for changing the form settings. This will look different from my screenshot if you are using a personal Google account. The screenshot above is what it should look like if you are using your school district's Google account. Either way, you need to make sure that the only box checked is the one that shows a progress bar (the progress bar isn't necessary, but I've always found it to be a nice aesthetic touch). The other two boxes might be useful for a form you want your students to fill out, but they are more likely to cause trouble for you than to help, so I would still always uncheck them. Unfortunately, the first box will always default to being checked, so you need to make sure you never skip this step. This can be confusing for our situation, since you aren't actually sending this type of quiz anywhere. In other situations, you might send a form to a specific person or group of people, or perhaps send one out on Facebook, Twitter, or Google+. But clicking the Send button (found in the upper righthand corner of the screen) also shows us the public link for the quiz as well as the embed code for placing the form fully inside a webpage (note that if you are using Google sites for your teacher site, you don't need to do any of step 7 - click here to view my overview of Google Sites and stay tuned for a future Google 101 episode on this). To see what the form looks like, click "View live form" at the top of the screen. We're now done with our form. 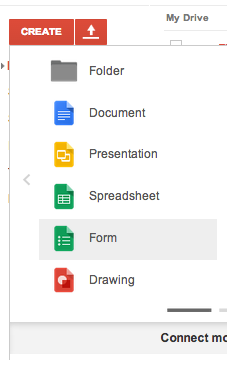 Because Google Drive is the best thing ever, there is no save button - the form has been saving as we've worked on it. You can find it in whatever Google Drive folder you were looking at whenever you first created it. As soon as someone submits a response, a spreadsheet will automatically be created in the same folder with the responses (actually, it should create it before they respond, but I've found that sometimes it doesn't). This is really great, especially for a parent contact form, because this spreadsheet can be sorted, formatted, printed, etc. just like any other spreadsheet. I like to add an extra column to mine for me to keep track of when I've called parents. If you want to see the spreadsheet before anyone has responded (so that you can change the look of it or whatever), click "Choose response destination" from the bar at the top (see below). If it says "View responses" instead, then that means it made the spreadsheet already. So, that's it. To view the form I created while making this tutorial, click here. Feel free to fill it out so that you can get a feel for what your students' parents will be doing. I encourage you to fill out your own form before sharing it, too, so that you catch any typos or errors you might have. Thanks for reading. Please feel free to comment below with any questions.